Energy Bills are rising day by day. And as suggested by Bureau of Labor Statistics, it is the electricity bill which contributes to the most to our energy bills. What’s worse, of our entire expenditure on housing each year, electricity bills account for roughly 9%. Hence, if you want to lower the energy bills, you cannot do so without first lowering your electricity consumption. That is exactly the reason why you need the Marey Gas 10L Digital Panel Tankless Water Heater. As water heating accounts for approximately 20% of total energy consumption of every household, you can significantly reduce these costs by turning to the Marey Gas tankless water heater. With a maximum energy efficiency of 87%, this heater minimizes the energy losses to tilt the balance of energy bills in your favor. 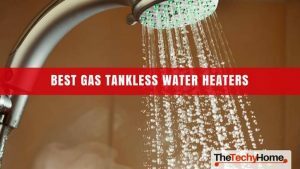 Hence, whether you want a heater which provides hot water 24*7 without a hitch – or which also saves energy while doing so, you need the Marey Gas 10L Digital Panel Tankless Water Heater. 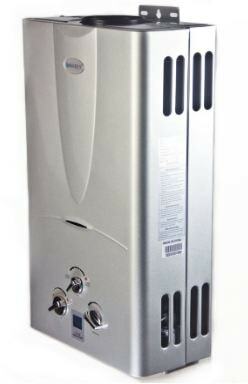 So far, we deviated your attention to the general advantages which a tankless heater might provide. From here on, we’ll dissect and analyze the most important features of this heater to find out whether or not it meets your needs. After my above mentioned tirade against electricity bills, it would have been comical had this heater drawn even a volt of electricity from your house. Luckily for me, then, it doesn’t as the entire heater, the bar just one part of its works on either Natural Gas or Propane depending on your convenience. What is that part, I hear you ask? Well, it is the pulse ignition of this heater which runs on electricity. However, you won’t have to connect an electric switch to the heater to turn it on. For, the ignition operates on 2-D cell batteries, which you’d have to purchases separately since they don’t come in the package. They aren’t costly and last longer meaning a set should last more than a month. 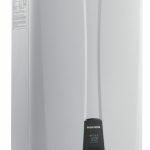 Therefore, if you share the disdain which I have towards electricity – and want a heater which works totally off the electric grid, you need to have the Marey Gas 10L Digital Panel Tankless Water Heater. Do you live in an area where temperature goes below freezing in extreme conditions? Have gone tired of water freezing in your pipes? If you have encountered any of these problems in the past, the Marey Gas heater has come to your rescue. You might ask: how will it do that? When the outside temperature reaches below zero, this heater allows you to remove its water discharge valve. As a result, the heater accumulates the water in its internal pipes to keep it from freezing. Thus, if you live up north and want searing hot water in extremely chilly condition, the Marey Gas 10L Digital Panel Tankless Water Heater will provide you just that. are known for their energy savings throughout the year. Thankfully, by providing this heater with a winter/summer switch, Marey hasn’t rested on its laurels but has taken the game to a whole new level instead. 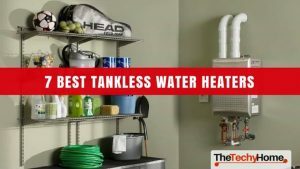 In most cases, the only feature tankless water heaters have to show for their energy savings is their energy efficiency. However, despite the fact that it boasts a reasonable 87% energy efficiency, this Marey heater has innovated with its combustion flame to bring the downfall of energy bills. For example, when it’s winter out there, the heater will automatically increase the size of its flame to provide the extra heat necessary. Consequently, no matter how cold it is outside, you’d get searing hot water in your washroom. However, come summer and sensing the temperature around it has dropped, the heater will reduce the size of its flame. Subsequently, it will regulate heat for summer and winter periods, resulting in added energy savings. Since it uses gases for its functioning, you have a right to be concerned about whether this heater is safe to use or not. For, unlike electricity, gases pose more hazards and hence require more safety precautions from your side. 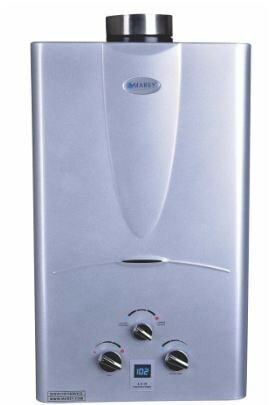 That said, since you are using the Marey Gas 10L heater, you won’t have to worry about its safety. Two features of this heater serve as proof. First up is the auto gas cut-off feature which closes the gas supply the moment the flame extinguishes for any reason. Apart from providing safety, this feature also results in increased energy savings because a flame running without any purpose would only increase energy bills. The second feature, one which you might have seen provided you use a pressure cooker, is the pressure relief valve. Pressure relief valves are designed to handle gas pressures up to a specific, safe limit. As soon as the safe limit gets exceeded, the valve opens, allowing the extra pressure to defuse. If not for the pressure relief valve, the pressure inside the system will continue to increase and might result in equipment failure or even fire in the worst case scenario. Hence, not only does it make you safe, but the pressure safety system used by this heater also mitigates the chances of equipment failure. With cheap heaters, there is always the problem of them not supplying water to upper floors. While they can supply water on their level, their performance drops as soon as the water goes above their height. Thankfully, due to the low pressure startup feature of this heater, it can provide hot water to multiple floors at the same time. It requires only 8PSI water pressure to start its function, meaning it would supply hot water even on low pressures. That said, while it has a low pressure startup, it won’t do so when the water flowrate is likewise. Put simply, when supplying the water to upper floors water demand should be adequate otherwise the system might overheat, resulting in its eventual shutdown. People having children or old people at home will love the digital panel for its usefulness. For, among other things, it makes the Marey Gas 10L Digital Panel Tankless Water Heater cinch to use. The digital panel contains three, extremely useful knobs and one LCD screen to let you play with the heater to get the desired water temperature. The first knob – the one located on top, would allow you to adjust the heater depending on the weather out there. As for the other two knobs, they allow you to adjust water and gas flowrates respectively, with the digital panel showing the internal heater temperature. 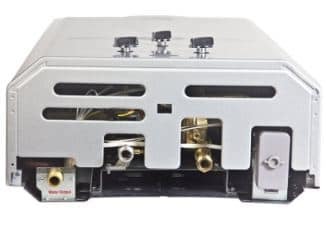 If you live in a large household – one which would require hot water for more than two showers at the same time, the 3.1GPM flowrate of this heater might prove inadequate. 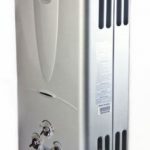 If you live in a condo or bathroom apartment – or anywhere else without the hot water requirements of a big household, the Marey Gas 10L Digital Panel Tankless Water Heater will prove to be more than sufficient. It consumes less energy, costs even less and has a body which can function on zero maintenance for years. What more can you ask!